I installed the plugin successfully but i’m not able to see my Limesdr mini in the settings menu. The same problem here. The tetra plugin works fine (audio decoding included) when using a RTLSDR-Blog v3 dongle but it doesn’t seem to work with the LimeSDR plugin (the WFM audio is not muted and no decoded calls are heard). just received my LimeSDR mini and trying to use it with sdr# ver. 1672. I copied SDRSharp.LimeSDR.dll from Goran repository to my sdr# directory but when I start it LimeSDR is not within the sources recognized! Claudio, did you follow instruction from github? Did you add line for LimeSDR into frontend config file and copy Limesuite.dll into SDR# folder? thanks Goran: now it works! now I have to find out how to set the 4 gain settings! Everything is working except with TETRA Demodulator plugin. Would be nice to have this feature working. Thanks!! 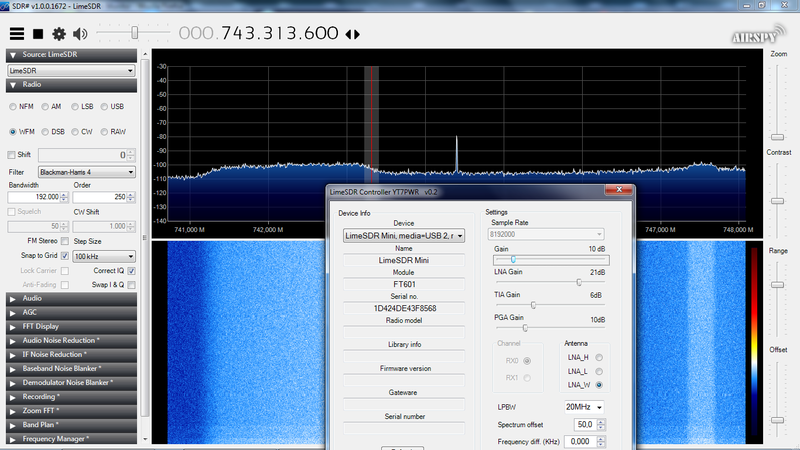 I am receiving the wideband transponder of the QO-100 satellite (Es’hail-2). I would like to use a Sample Rate around 8000000 as this is the bandwith of the channel. im 'tdbone1" in this thread. you might find some good info in there. thanks Goran: it seems it works! the large hump on the left is the 2MS/s DATV beacon while the smaller one on the right (~747.5MHz) is a 333KS/s DATV signal. the spike in the center should not be there! the “Correct IQ” feature is useless. thanks en1gma: I will read it later. Almost finished but the daily job is a priority.